although a relative newcomer to the UK, Scheu Analog has been in business since the late 1980s. This makes it one of a number of turntable manufacturers who started up their business just as the LP was allegedly in its death throes. 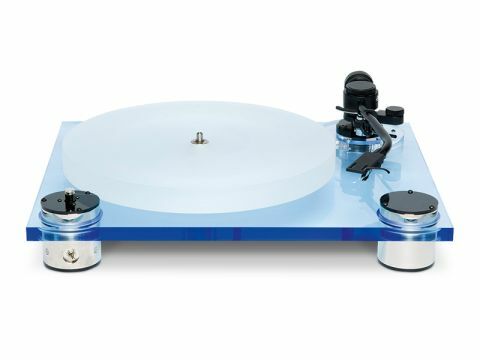 Perhaps, for that reason, the company's range is not vast, (there are only four turntables and three arms available), but distinctly exotic-looking in design. The Cello (including a Jelco SA-250 arm) is a rectangular slab of acrylic with three feet, an arm mount and a bearing. The most obvious difference from other designs is that the motor is housed, very ingeniously, in the front left foot. It's a small DC motor with electronic speed control and a small toggle switch that selects the speed. Instead of a drive belt there's a drive string. In fact, a thin thread can be a highly satisfactory trick and Scheu simply provides a small bobbin of fine nylon thread, just over a tenth of a millimetre in diameter! However, as it's up to the happy owner to cut a length of this and tie a knot in the right place, you may end up exhausting your supply of expletives. Eventually, one gets a good tight loop the right length which gives good drive to the frosted-finish acrylic platter. Once again, there was some disagreement among our listeners about the Scheu's bass: is it powerful and propulsive or a little shy? A little investigative work suggests the probable cause. Playing a variety of familiar discs suggested that the bass is rather better in lively, dynamic moments (a rock drum kit being a perfect example) than in sustained tuned notes (church organ, bass tuba and so forth). The latter tends to sound a little underwhelming, although taken in isolation it's not at all bad. But the transient energy conveyed by the deck goes a long way towards making the sound very attractive. A closely related area of performance, 'pace', was also singled out for praise. This is a little more subtle than rhythm, involving as it does not just excitement but also, at suitable moments, restraint. That's necessary to keep the sound from being too frantic, something that we've all come across now and then. Higher frequencies are well served by the Cello, with good detail across the board and very good life and vibrancy. The treble is always very clean, but prepared to scream and shout when the music demands it – no shrinking violet here! This can be deceptive, though, the treble occasionally seeming restrained in recordings that are only moderately busy in the top octaves. There was a little puzzlement expressed at the Cello's handling of dynamics. Just occasionally, detail seems a little muted, though as mentioned above it is generally good and surface noise seems slightly more prominent than via some of the decks. Imaging is good, instruments occupying a consistent and stable position in space and there is some decent depth in the image, too.